Last weekend saw Sony's Venom not only take the top spot at the box office with $80.2 million, but that was also good enough for the all time October record. Bradley Cooper and Lady Gaga's A Star Is Born also did quite well, earning $42.9 million. This weekend sees a trio of new releases that will represent stiff competition and will make for a crowded frame, offering moviegoers a wide array of choices. But can any of these newcomers take down Tom Hardy's Venom? The answer to that question is probably not. Venom, even with a drop of more than 50 percent at the box office, should still be able to fend off any newcomers. 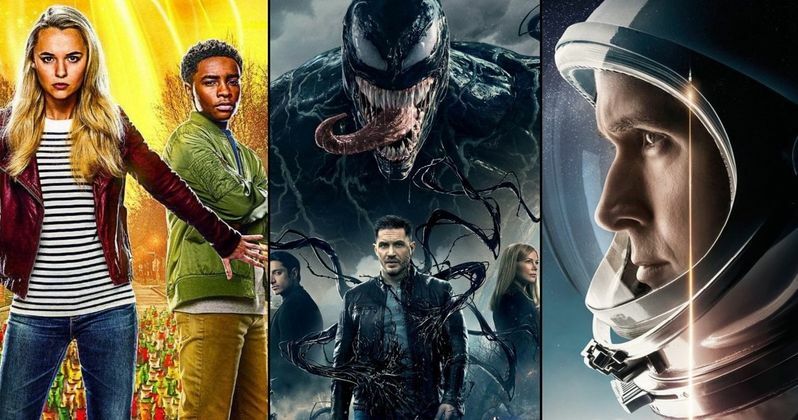 Depending on how much these new releases take away from its potential second weekend take, and depending on whether or not word of mouth is more positive than negative, the Marvel Comics adaptation could bring in anywhere between $30 and $40 million. But even on the low end, that will be good enough for the number one spot again. Coming in second place should be First Man, which stars Ryan Gosling as Neil Armstrong. This serves as director Damien Chazelle's follow-up to La La Land and has been earning rave reviews thus far. Even though it won't make the number one spot, the biopic should do solid business and bring in between $20 and $25 million. It's going to be a very tight race between the two, three and four spots this weekend. A Star Is Born, thanks to word of mouth and star power, should wind up in the three spot with between $20 and $25 million as well, but First Man has the edge in its debut. The number four spot should go to Goosebumps: Haunted Halloween, which serves as a follow-up to 2015's previous adaptation of R.L. Stine's kid-friendly horror books. The family-friendly Halloween-themed sequel should bring in around $20 million. Other family flicks such as Smallfoot and The House With a Clock in Its Walls, could harm the movie's overall earning potential. This weekend's other new big release, Bad Times at the El Royale, may barely miss out on the top five. Estimates for director Drew Goddard's latest, which boasts a great ensemble cast including Jeff Bridges and Dakota Johnson, vary widely, with the low-end set at $8 million and more bullish projections putting it at $17 million. Last but not least, Beautiful Boy, which stars Steve Carell and Timothee Chalamet, will hit theaters as an awards season hopeful. Be sure to check out our full list of box office predictions below and check back with us on Sunday for the weekend estimates. These numbers come to us courtesy of Box Office Mojo.